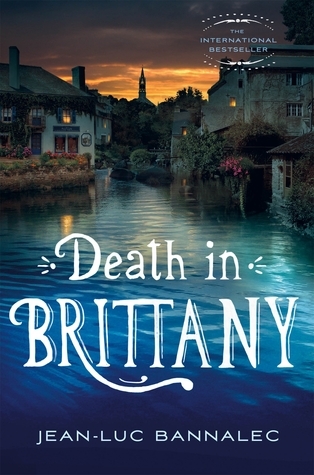 Today I'm featuring Death in Brittany by Jean-Luc Bannalec which I borrowed from the library. Page 56: "'Bonjour, Monsieur. Commissaire Dupin here. I'm investigating the murder of Pierre-Louis Pennec." My thoughts: This international bestseller is the first in a new series. I am enjoying getting to know Commissaire Dupin in a historic setting along the French coast. Frombarnesandnoble.com: Commissaire Georges Dupin, a Parisian-born caffeine junkie recently relocated from the glamour of Paris to the remote (if picturesque) Breton coast, is not happy when he is dragged from his morning croissant and coffee to the scene of a curious murder. The local village of Pont-Aven-a sleepy community by the sea where everyone knows one other and nothing much seems to happen-is in shock. The legendary ninety-one-year-old hotelier Pierre-Louis Pennec, owner of the Central Hotel, has been found dead. A picture-perfect seaside village which played host to Gaugin in the 19th century, Pont-Aven is at the height of its tourist season and is immediately thrown into uproar. Dupin and his team identify five principal suspects, including a rising political star, a longtime friend of the victim, and a wealthy art historian. An obstinate detective whose unconventional methods include good food, good wine, and taking in plenty of sea air, Dupin finds his case further complicated when ongoing incidents compound the mystery. As Dupin delves further into the lives of the victim and the suspects, he uncovers a web of secrecy and silence that belies the village's quaint image. A delectable read, Death in Brittany by Jean-Luc Bannalec transports readers to the French coast where you can practically smell the sea air and taste the perfectly cooked steak frites in an expertly crafted, page-turning mystery. Friday Focus: The Friday 56 & Book Beginnings #88 was originally published by Catherine for bookclublibrarian.com. This post cannot be republished without attribution. Retweeting and sharing on Google+ are encouraged and appreciated.